In my previous update (on 16-June-2016), I discussed about the TOFFEE-Mocha project introduction, agenda and software development update (Refer: HERE). So far I completed the Constant Packet and Dynamic Packet delay features within the TOFFEE-Mocha kernel modules. Now I supported and finished complete GUI support of these parameters so that you can configure, store, reboot and the same will restore upon reboot. Besides I complete the TOFFEE-Mocha Big-Picture page. 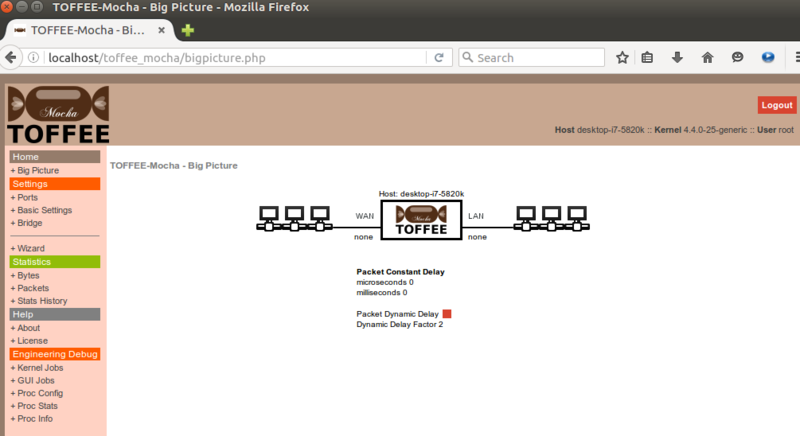 The Big picture is an interface where you can find all the configuration (or settings) of the TOFFEE-Mocha. This is almost similar to CISCO device show all command but in graphical representation. Sometimes a network admin can also print the Big Picture page and paste it near to the device to refer its settings. TOFFEE-Mocha Stats: Apart from big picture, I finished the stats (statistics) pages. The first TOFFEE-Mocha home page shows the consolidated stats report. And in the dedicated stats pages users can view the live stats such as packet wise stats and packet bytes wise stats. TOFFEE-Mocha is a WAN Emulation device, so the intent of these stats is to get data about dropped packets (if set), duplicate packets (if set and once it is implemented in future) and so on. Random Packet drop feature: Currently I am working on the TOFFEE-Mocha kernel modules to support Random Packet Drop feature. With this feature users can randomly drop few packets here and there on purpose. This will simulate the unreliable WAN network scenarios. I am yet to fully develop and finish this feature by today and tomorrow (that is 17-18 June-2016). And I will update once it is done in my upcoming live update video about the same.